Yes, cats can drink tea, but it should be in a very limited amount at a time, or just as a rare treat. 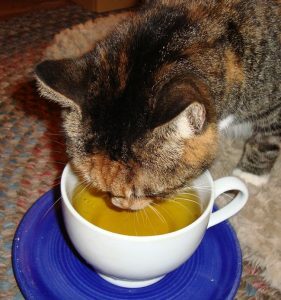 All types of tea, like black, green, white and yellow, come from the same source and are okay for your cat. But the condition is – the tea you are offering is decaf, unsweetened, and free of artificial flavors (like in Earl Grey scented tea, or jasmine/peppermint/ginger teas). Many cats seem to have a fondness for the aroma and flavor of tea, and would instantly start to meow the moment they even hear the sound of your kettle, teapot or teacup! However, tea is something that is not recommended for these animals on a regular basis, and under no circumstances can be a substitute for plain drinking water. Honestly, your cat does not need tea, nor does it derive any nutritional benefits from it as unlike humans, felines do not require antioxidants to fight against free radicals. Also, offering them milk-tea might give your cat digestive problems including diarrhea, vomiting or loose stool since most cats have issues of lactic intolerance. Similarly, iced or cold tea is also not good for your cat (especially if it is still a kitten), since it might give it throat infections. Increased consumption tea may affect your cat’s health adversely. Moreover, giving it caffeinated teas may prove dangerous for its health, even to the extent of putting its life at stake. In fact, caffeine is a kind of xanthine (a type of alkaloid) which the cats are unable to break down because they do not have liver enzymes for the purpose. Do not give a second thought if you find any of the above symptoms of caffeine intoxication, but rush to the nearest vet, or else, contact the ASPCA 24×7 helpline immediately at (888) 426-4435. Published on December 19th 2017 by Shiloh Nevada under . Article was last reviewed on 19th December 2017.